In 2016, Timothy Dye, a professor of public health sciences at the University of Rochester, traveled with a team to Puerto Rico to help local medical personnel deal with a Zika epidemic. In the process, they interviewed residents on their attitudes and living conditions, ending up with a voluminous amount of data. Dye and Luo are just two of the more than 40 faculty members from across the University whose research either relies on or furthers the new and fast developing field of data science. 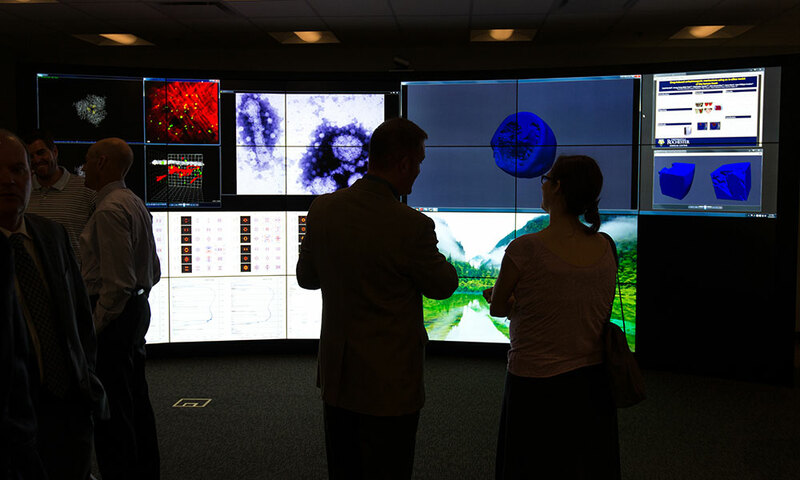 To harness their strengths, and facilitate collaborations such as the one between Dye and Luo, the University launched the Goergen Institute for Data Science in 2016. The institute is part of a $50 million investment by the University in the new field. Located in the state-of-the-art Wegmans Hall, it serves as a hub for research, education, and external partnerships. So far, 14 new faculty have been hired in areas in which data science plays a critical role, including bioinformatics, biomedical engineering, brain and cognitive sciences, business and economics, computer science, mathematics and statistics, physics, and political science. The institute serves as a resource for companies and organizations in a range of fields, including retail, medical, science, and law enforcement. While those partners will gain valuable insights to help their operations, relationships benefit the University, as well. Bob Maybee, the vice president of customer insights at Wegmans Food Markets, says Wegmans has taken on two interns to help the company use processed data to better serve its customers. Research that relies on solid data science can upend common assumptions, leading to better business strategies and, in a public health crisis such as a disease epidemic, better policies. Using recorded interviews from Dye’s team, Luo is now working on a voice-recognition program that will efficiently provide valuable information about public attitudes, and give medical personnel a clearer picture of the physical environments in which the local populace live. As Dye and his team collect more Zika-related data from under-developed regions of the world, the algorithm used in Luo’s software will only continue to improve.